Shakespeare’s Globe will take the Wars of the Roses to the battlefields on which they were fought as part of its new season, which also brings Roger Allam back to the theatre where he won an Olivier award two years ago. Shakespeare’s Henry VI trilogy shows Britain’s escalating civil war following the loss of its French territories during the Hundred Years War, portraying a rudderless country in which fathers and sons find themselves on opposing sides, and depicting the rise of the most notorious Plantagenet ruler of all, Richard of Gloucester, who became Richard III. Following its premiere at the York Theatre Royal in June, Nick Bagnall’s touring production will stop of at the four battle sites of the period: Tewkesbury, St Albans, Barnet and Towton. The last of these encounters resulted in “the biggest loss of life ever on English soil in a single day,” artistic director Dominic Dromgoole explained, with 28,000 causalities incurred before Edward IV displaced Henry VI as king. 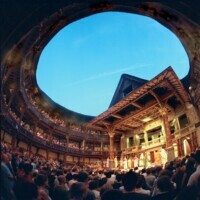 Back at the Globe’s South Bank home, Allam will play Prospero in The Tempest, the last of Shakespeare’s late romances. “He’s got the voice, wit and intelligence to play that room, which is a gift that isn’t given to everyone,” said Dromgoole. Allam will be joined by Merlin‘s Colin Morgan as the airy sprite Ariel and Jessie Buckley, runner-up in the BBC casting series I’d Do Anything, as his daughter Miranda. The production reunites Allam with Jeremy Herrin, who directed him in Uncle Vanya last year and returns to the Globe following his acclaimed Much Ado About Nothing in 2011. Eve Best, who played Beatrice in that production, will make her own directorial debut as part of the Season of Plenty, overseeing a production of Macbeth starring Joseph Millson, himself a former Benedick for the Royal Shakespeare Company. Dromgoole will direct A Midsummer Night’s Dream with yet another Olivier award winner, Michelle Terry, as Titania. The season also includes three new plays, the most in the theatre’s history: Blue Stockings, the first play by director Jessica Swale; Ché Walker’s anarchic version of The Bacchae, The Lightning Child; and Gabriel, by Samuel Adamson, which explores 17th-century musicians and their patrons, and will star renowned trumpeter Alison Balsom. But – despite this week’s excitement about the rediscovery of Richard III’s remains not far from the battlefield of Bosworth, where he fell – Dromgoole said he didn’t regret not commissioning a production of Shakespeare’s last play in the history sequence, Richard III, and touring it to one extra battlefield. “The Guardian Players can have that one,” he joked.